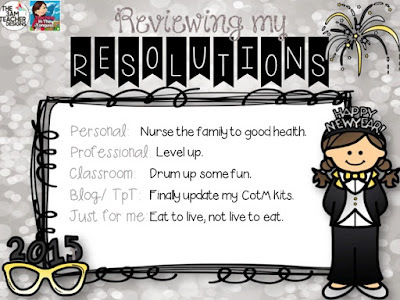 Blogging family, do you remember reading my new years resolutions for 2015? I'm sure you do. They are probably written on your heart like your children's birth dates, your favorite passage of scripture or the lyrics to "Ice Ice Baby". (Hush! I still know all the words!) Well, if you'd like to review my noble intentions you can check them out HERE. Don't worry. If you don't want to click back and relive it all, I'm going to let you know how I'm doing! I'm linking up with my pal, Aileen Miracle at Mrs. Miracle's Music Room, to review our resolutions. My husband is improving, but still not well. He's been following doctor's orders, eating better and just this week is taking a hand full of vitamins and supplements and a weekly SHOT. Yikes! He's such a trooper. I admire his strength and perseverance. So, my original plan was to take an Orff or Kodaly level this summer. Plans have changed. Not doing that. Why? Well mostly a time commitment. My school has granted me a one year sabbatical (which I am EXTREMELY thankful for!) During this time I'll work to keep my family healthy and schedule a surgery that I have been putting off. Sooooo....we are spending very frugally and I am using every single spare minute of my summer days to work on my store as it will be providing our income during this time. I think I'll just put this one on the shelf and pull it off for next year. This resolution was to find new and exciting ways to use my brand new set of tubanos more. This was so much fun! We used them to read rhythms, to accompany "The Lion Sleeps to Night", to explore form, to create our own pieces and to learn to listen to each other more. I found a Lynn Kleiner book that I liked and used some activities by Artie Almeida. Can't wait to add even more! My Composer of the Month kits are a popular seller and are an incredibly easy way to include some music history lessons without much prep or ...well...without much intention. I can hang up the bulletin board and plan one listening activity during a month and students really get into it! At the end of the year I have requests to listen to music from our Composers of the Month from September and October. I love that. But, uhm...I....er.... yeah. I haven't made any more. *hanging head in shame* Not even one. 5. Eat to live, not live to eat. I had this for breakfast. 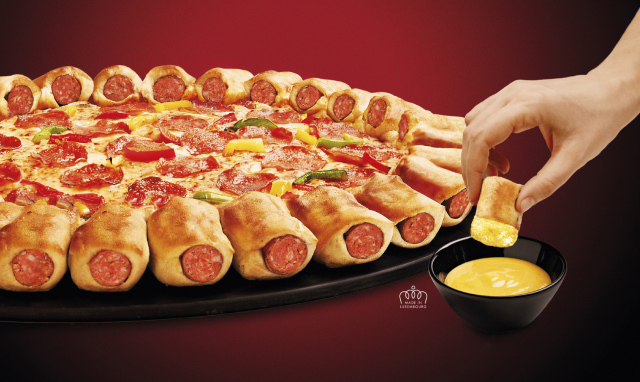 With cheese dip. Last week's project for Summer Project Sundays was a workstation to practice identifying pitches using a dip tray from a dollar store and recycled bottle caps. You can read about it HERE. This week I'm going to share a couple more dip tray workstations that I've created. The dip tray stations that I've created this week are really just prettied up versions of workstations that I've used for years. The dip trays add a bit of novelty and are easy to use and store. I bought several at my local dollar store. In addition to the trays you'll need a permanent marker and some Velcro dots. I like to provide my third graders many ways to practice identifying instruments and sorting them into their families or by their characteristics. This is another way for them to use that skill and is easy to slip into our workstations rotation. The cards that I have used for this activity are actually from an Instrument Matching Game that you can get in my store. The dip tray has sections labeled for each of the four basic instrument families. If you use a different classification system, there is more than enough room to write those categories instead of the basic four. I used a permanent marker, but you could also print out the names and use contact paper to attach them. The permanent marker can actually be removed by using one of those Mr. Clean magic erasers. Students work as a team to identify the instrument family and then put the cards in the appropriate spot. I store the cards in a plastic baggie, but a plastic travel soap box works really well too! You can see how I've used them to store crayons in THIS post. I think I'll store my cards in one of these next year. As often as I can, I include a task card at the workstations I set up so that students can refer to them instead of running up to me every few minutes. I laminate the card and store it in a file box. I can easily direct a sub to find these supplies and set up workstations in my absence. The next dip tray workstation that I've created helps students practice using their knowledge of note values. You can download this file for free HERE. The file contains two different sets of number labels that you can use to attach to your dip trays, rhythm addition problems and instructions. I printed out the number labels, trimmed them and then laminated them and cut them out again. I attached them with Velcro. I attached one part of the Velcro dot to the dip tray and the other to the back of the number. This allows me to switch up the activity and adjust it to meet the needs of my students. In this activity students are asked to draw a card, add the note values together and then place the card in the space that matches their answer. The file has 25 different problems, but I usually include duplicates if we are just working a a few note values. I used to use notes and addition problems written on index cards for this activity. Students sorted their cards into trays, coffee cans or whatever I had laying around. I love the convenience of using this activity with the dip tray and smaller cards. I use this activity with several grade levels and some groups need the help of a note value chart. I love THIS one by Sara Bibee. It's a free download and is perfect for so many activities in music class. This is an example of a modification I make for younger students or special learners. Instead of using all of the cards, I'll sort out the ones that equal 1, 2 and 4 and then set up the dip tray like this. Students are still practicing the skill I need them to learn, but in a more controlled setting. I have plans for several other sorting activities that I could use with this dip tray. I love how easy it is to pull off all of the cards and replace them with whatever I may need. I really hope that you enjoy using these files and that you like the dip tray workstations as much as I do! I'm joining some other bloggers today to dream just a little. I have been creating and selling teacher resources for about 7 years or so. I got several years before that when I went hunting the Internet for music bulletin board ideas and products. I didn't find much at all! Not discouraged, I thought I would create some and post them on a website to share with other teachers. Thus, Bulletin Boards for the Music Classroom was born. I loved creating and sharing and loved the feedback from other teachers. A couple of years ago I found Teachers Pay Teachers and this little hobby has flourished into a part-time business. Today, I'm daring to dream about what the future may hold. I'm linking up with Third in Hollywood's blog. Be sure to click and dream with others too! This seems to be SO close and yet so far away. Last year my husband and I took Dave Ramsey's Financial Peace Institution classes. It was a smack in the face and we knew that we had to make some changes. We created a budget, we tracked our spending. We dreamed about a day when we wouldn't have to worry about how the ends would meet. We decided to live without the burden of credit. Then...well, we were in a car accident in July. I broke my wrist. My husband broke his sternum and was pretty scratched up. We lived. We were miserable but we lived. So thankful! 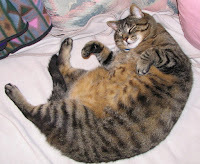 My husband spent the night in the hospital and watched as his abdomen and side swelled and ached. The seat belt had saved his life, but really messed him up too! His doctor stopped his blood thinners as his abdomen grew to twice its normal side. A few weeks later, he suffered a stroke. What a difficult time for him and for our family. We were thankful as friends and family reached out to help us in every way possible during this time. Months of therapy, a pacemaker/defibrillator in December and many doctor's visits later our perfect plan to be debt-free seemed almost impossible. God has blessed in the last year and we are hanging on. 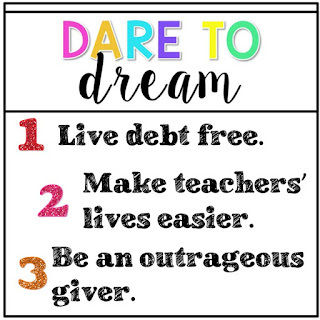 I dream about a day where my online business will allow me to live completely debt free. 2. Make teachers' lives easier. It is tough being a teacher and juggling all the demands on our time and resources. I create products that make teachers' lives easier and save them precious time. I hope that by downloading a bulletin board that's ready to go or worksheets that require no prep help teachers use their time at school more effectively. In the same way, I hope that teachers look at my products and are inspired to try something new. Doing something new, happy with a few extra minutes, using great resources...what a great way to create a joyful classroom! 3. Be an outrageous giver. 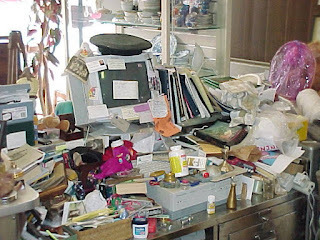 Did you ever watch the Oprah's Favorite Things show when the audience got TONS of stuff? Surely you've seen the one where everyone in the audience gets a car? 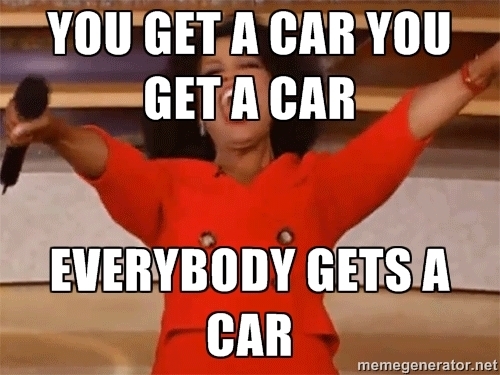 Oprah goes running around screaming "YOU GET A CAR! 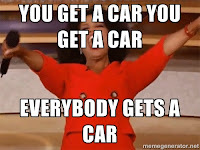 And YOU get a car! And YOU get a car! And YOU get a car!" Yeah, I want to do that. I want to be an outrageous giver. I have been so blessed, I would love to be able to meet the needs in my community. I would love to be able to surprise my family with amazing gifts for no reason. 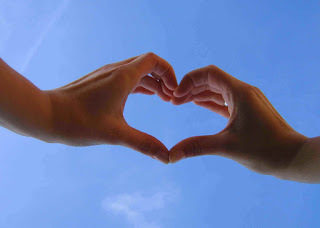 I would love to be an unstoppable force of love in Jesus' name. I dream about being an outrageous giver. It's fun to dream, isn't it? 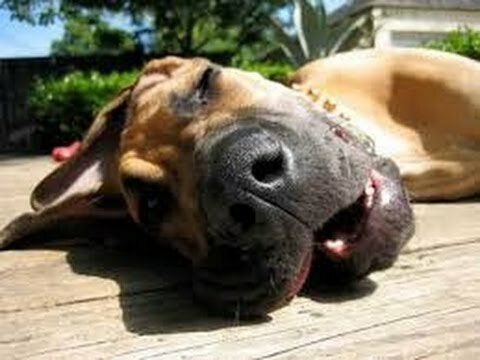 What are you dreaming about this summer? Like many teachers and moms, I am a big fan of dollar stores. I love a good deal and am often inspired to create while walking the aisles. My husband is most tolerant of my dollar store ways, so that helps feed my addiction too. 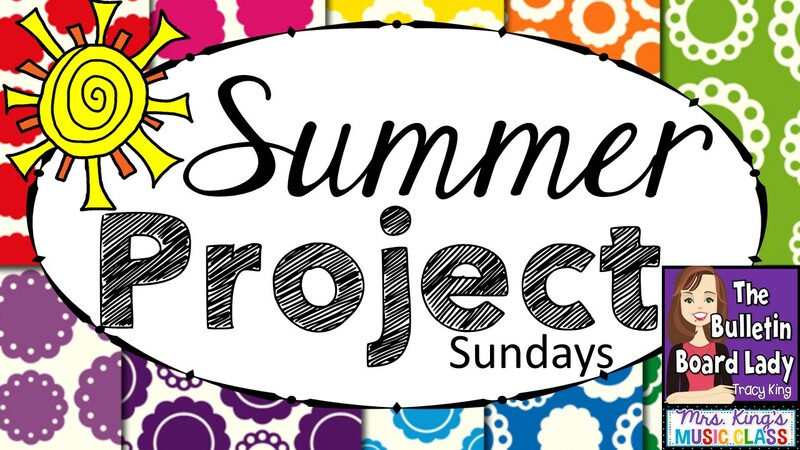 In this week's edition of Summer Project Sundays I'm sharing a project with you that is fun to make, fun to use and inexpensive if you have a dollar store near you. This week's project is a Dip Tray Workstation. This workstation is great for 3rd grade and up. 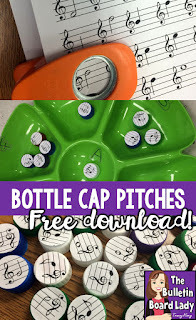 Students are given a box or bag of bottle caps that have treble clef notes on them. Students identify the note and then place it in the appropriate compartment. My students loved the novelty of playing with the bottle caps and the dip trays. I loved that they were practicing naming treble clef pitches and staying on task. To make this dip tray center, I printed out a set of treble clef pitches on the staff. Using a 1-inch hole punch I punched out each of the notes. I printed this sheet on both card stock and regular copy paper. There wasn't much of a difference in the finished project, but I thought it was easier to manipulate the ones that were printed on card stock. I have a large collection of bottle caps that I use for a variety of activities (including Bottle Cap Staff). I just grabbed a few of them for this project. If you choose to start collecting them, 2 liter soda bottles work best. There are also some plastic water bottles that have lids with a 1-inch diameter that would work well too. After the notes have been punched out, I attached them to a bottle cap with regular school glue. This was such a bad idea! After the first group I realized that this was not a good solution. The notes popped right off bottle cap. I took that batch home and used Modge Podge (an adhesive and sealer) on them. This worked MUCH better! I would recommend using it instead of school glue for your project. The finished result was a unique and useful music manipulative. My kiddos really enjoyed this activity. It was a great addition to my pitch workstations. My students used the dip tray workstation on the floor, but it could just as easily be used at a desk or table. Pin this idea for later. Welcome to another edition of Summer Project Sundays. Last week I posted pictures of my ponies, my pool noodle ponies. This week I'm sharing another project with noodles because they seem to be everywhere this time of year! I suppose my inspiration for pool noodle swords is quite evident. Have you ever seen a bunch of kids using them in the pool? They make a great weapons! LOL. Okay...don't tell my kids I said that! I loved the sound that they made when whacked against each other and new my students would as well. smooth, large blade. It was very easy to cut through each of the pool noodles. I cut each noodle in half (or as close to half as I could guesstimate). Next, using shiny silver duct tape and regular black duct tape I created handles for each of the swords. I didn't worry about being precise and tore the tape rather than trying to cut it. For best results, put a piece of tape on the bottom of the noodle to cover the hole, then cover about 5 inches or so with the same color. Tear a couple of rectangles to put on each side of that as a "button" to turn the swords on when they become light sabers. I also went back and added a trim of black or silver when they were all finished. I just wanted to make sure I had enough tape before embellishing. I made 24 noodles with 2 rolls of tape. In my classroom they were stored in a large laundry tub with handles until I found a sturdy basket that worked well. I use them for several different movement activities with K-2, but my favorite activity works for K-6. My fifth and sixth graders LOVED learning about the music of John Williams. 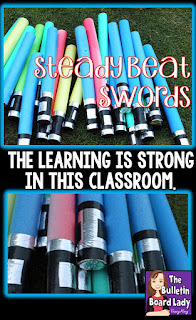 At the end of our John Williams studies we used the pool noodles or "Steady Beat Light Sabers" to explore the form of "Imperial March". You can read about some of the John Williams activities HERE. Before we start with this activity, I pass out the swords and explain that even one single attempt to use the steady beat sabers to hit or poke another person will cause them to be retired. No one wants to miss out on the opportunity to play with swords in music class so behavior is EXCELLENT during this activity. Here's a silly little thing I do before we begin. The video shows a group of third graders. Silly, right? The kids love it! Before we listen to "Imperial March" we discuss how composers use music to represent characters in stories. We'll talk about Peter and the Wolf and the motif used for the wicked witch in The Wizard of Oz. I'll ask them to raise their hand as soon as they know what character is represented by the music. Hands shoot in the air as the main theme of "Imperial March" starts. I'll explain that when we get our steady beat light sabers that we'll keep the beat with a partner when we hear the theme and then we'll pretend to be jedi knights and sneak around the room looking for bad guys. When they hear the theme again, they should find their partner and keep the steady beat again. For older classes, I'll encourage them to find an advanced way to keep the steady beat. This might mean tapping the swords together high and then low, using both hands or even adding a little turn. Such fun! Here's a clip from a 5th grade group. Some classes also use the swords for a play along. I found this little gem while looking for something else on Youtube. The link takes you to a SafeShare version that I use in the classroom. I like not having to worry about what may pop up at the end of the video. 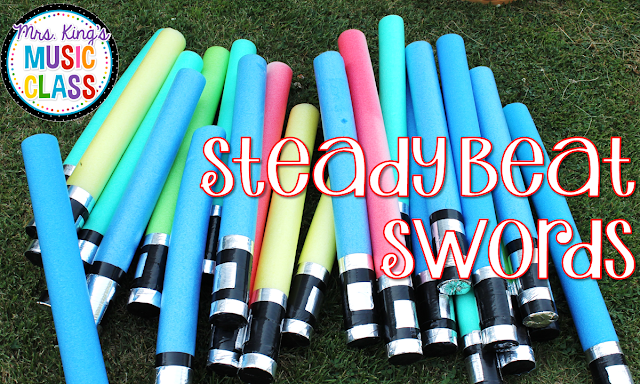 I hope you enjoy making steady beat swords or steady beat light sabers this summer! Let me know of some ways you use them in your classroom. My kiddos will LOVE more opportunities to play and learn. Ah! June! It's one of my favorite months just because I can almost hear the screeeeeeeeetch of my life as I hit the brakes and try to slow the pace of every day life. This year, however, is a bit different. This year I am starting my "new" job. Due to some medical issues with my husband and my need to have a surgery (with a lengthy recovery) my district has granted me a one year sabbatical. I am excited to have this time with my kids. Although my son is 15 and is not terribly interested in spending MORE time with Mom, my three year old thinks that I'm a rock star and can't get enough play time. I'm also grateful for the time to help my husband heal. During this time I'll be working on resources for my website and Teachers Pay Teachers store. I'll also be able to travel and present workshops a little more. So during June, I'll be working furiously to get things ready for the back-to-school rush that comes during August and September. I don't want to lose sight of all the other fabulous things there are to do in the summer so I've decided put a few goals down in this blog post. 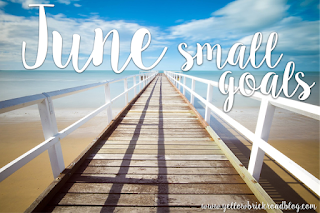 I'm linking up with Jennifer from The Yellow Brick Road to share our goals for the month of June. Shut up. I don't do much of this during the school year. My body can only go so long on 5-6 hours a day before it shuts down. I start to feel that every May and am thankful that I only have to set my alarm a couple of days a week during June. In only two weeks, I've already felt a difference. Soon, I'll have to give up my sleep all night and sit all day routine for something healthier, but *whew* right now I am loving it! 2. Organize just a little. We moved to a tiny little house during May and although it LOOKS like we are moved in there are two closest that are crammed from top to bottom with boxes and bags and stuff that had no other place to go. I figure that as soon as I've tidied this up and organized the stuff in those closets that I'll have more room to cram new stuff. Win! I'm also working on organizing a work space for the next year (no office in the new house). I've downloaded a great planner and customized it for my needs and am making short term goals to keep me on track. Later this month I'll blog a little about the planner and let you know how I'm doing. I'm excited about possibly working while sipping sweet tea and sitting on the patio. 3. Eat better. Move more. I've been thinking about this one for a month or two now. This Sunday, my pastor challenged us to choose a focus word and scripture for the summer. I was already there. My word? Give. During the school year it is so easy to get caught up in the hustle and bustle of life. This summer, I'm going to focus on giving more. I hope to give more time to play with and listen to my family. I hope to give more time to local charities and needs. I hope to give more to those that may need a little bit of encouragement. 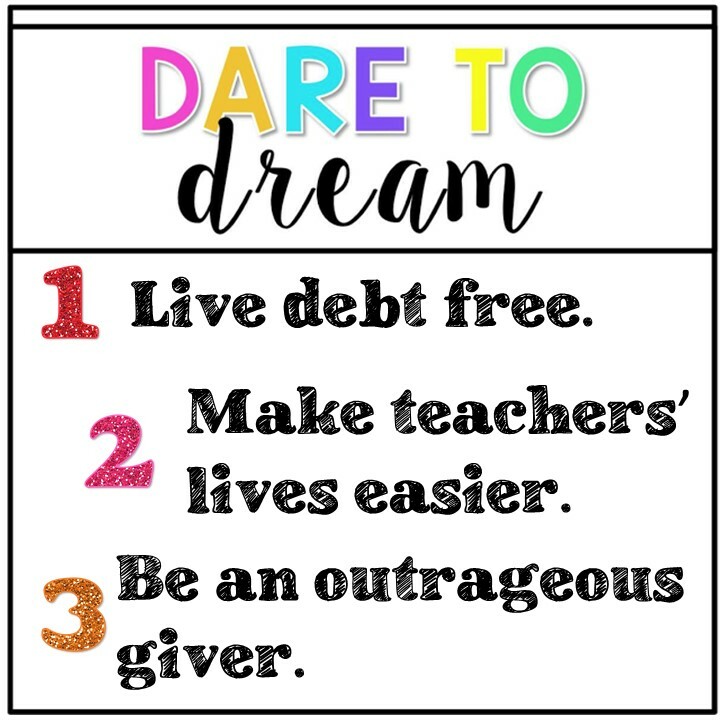 I hope to give more financially as we work to live debt free and on a budget. I hope to give more of myself so that I can be less like me and more like Jesus. Hurray for summer! If you are a teacher, it means a slightly slower schedule but many projects. My summers are filled with professional development, college classes, designing next year's classroom (I'm sure that I'll totally get it perfect riiiiiiiight before I retire.) and working on the projects I just couldn't squeeze in during the school year. Join me during June and July for Summer Project Sundays. This series of blog posts will inspire you to get started on a few projects of your own. 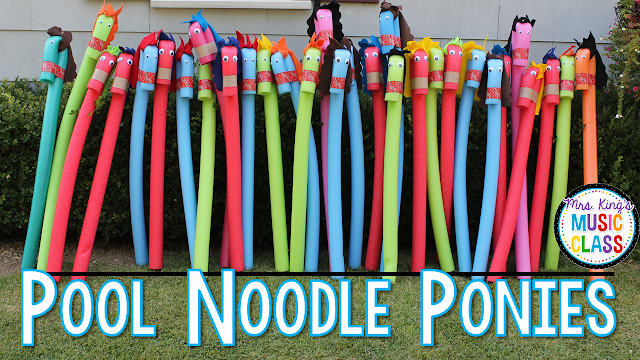 A few years ago I posted about how to create Pool Noodle Ponies. Check out that post HERE to learn how to create these adorable creatures! Last summer I gained an entire herd of noodle ponies. I had been in a car accident, so I really just supervised their construction. My fabulous sister in law manned the pony factory and created them. We decided to use a western themed duct tape to bind them together. I love how that turned out! You know that song "Here We Go 'Round the Mulberry Bush"? It is used as a nursery rhyme reminder of daily chores (Monday=wash the clothes, Tuesday=iron the clothes, Wednesday=mend the clothes, etc...). You may have learned this version in elementary school. Check out this link to learn about pioneer living and daily chores. This song transforms into a perfect pool noodle pony song! Take a look at a video of some of my Kindergarteners using their ponies with this song. Fun, right? This is an adaptation of an activity by the amazing Artie Almeida. Here are some of the lyrics we use: 1. This is the way we walk our horse 2. This is the way we pet our horse 3. This is the way we trot our horse 4. This is the way we water our horse 5. This is the way we jump our horse 6. This is the way we feed our horse 7. This is the way we race our horse 8. This is the way we brush our horse 9. This is the way we trade our horse (Chaotic but fun!) 10. This is the way we stable our horse (put horses back in their tub "stable") 2. Act Out Horse Songs A couple of my favorite are "10 Little Horses" (think 10 Little Indians) and "Trot Old Joe". Trot Old Joe Trot old Joe, trot old Joe, You ride better than any horse I know. Trot old Joe, trot old Joe You're the best horse in the country, oh Whoa, Joe! We keep the steady beat on our laps like singing. Then we change the lyrics so that old Joe can walk, run, jump, skip, dance etc... After learning this song it is great fun to act it out with the pool noodle ponies. It's a great way to talk about tempo and it creates a memorable experience for your kiddos. 3. William Tell's Overture Who doesn't love this classic? I've done it with instruments, with movement, with manipulatives and now with noodle ponies. Create a listening map for this piece (or use the fabulous one in Artie Almeida's "Parachutes, Ribbons and Scarves, Oh My". On the "A" section, ponies trot in a circle. Use instruments or other movement during the other sections. 4. Wild Donkeys (from Carnival of the Animals) This quick little piece (called "Wild Asses" in most translations) is perfect for getting the wiggles out with a noodle pony ride. I have about 8 students line up with their ponies. Four students on one side of the room and their partner on the other side. Students switch places with their partner by galloping with their noodle. They start when the music starts and stop when the music stops. This activity is usually used with several Carnival of the Animals activities. Read more about those HERE. We talk about tempo, but don't really analyze the piece. I use it more as an opportunity for them to get to hear the piece over and over in an exciting way. When we go back to listen to the pieces from CofA they really know this one! There are many other ways to use the ponies in your classroom. If you've used them, I would love to hear about it or see pictures.